"Internet is a collection of computer networks that is connected around the world...."
The iPhone photo of that old memo shown above comes from assistant producer Sam Sanders. Sam posted it on the Instagram photo-sharing service last week. That's where NPR's multimedia staff saw it and shared it on their Tumblr page, where it was quickly "liked" and re-blogged hundred of times. All of this just underscores how much the world has changed in a mere 18 years -- as does the fact that the memo was sent in paper form to begin with. Along with Pam's copy of a 20-page manual handed out the following month to explain how to use email, that 1994 memo brought back memories from those relatively early days on the digital frontier. OK, "early" for those who weren't directly involved in academia, technology or national security. 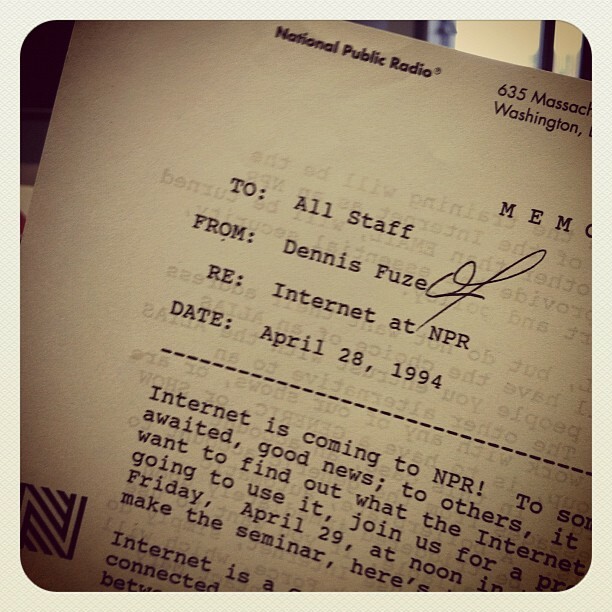 NPR's Internet link was established around the same time I joined the staff at the News & Observer in Raleigh-Durham, N.C. -- one of the very first newspapers to invest heavily in online anything. I was hired to cover science and technology. My only qualification: The editors told me I was one of the first reporters they'd met who had a personal email address. The cluster of universities and technology businesses that make up North Carolina's Research Triangle area meant I was writing for a readership that was unusually well-connected digitally. But the newspaper's editorial style also required me to define any terms I used in my stories that were not yet in common use. Not so easy, given my beat, which led to some fairly contoured phrases in my stories. In a February 1995 article about a hacking case, I had to define the "the Internet," which I called "a vast matrix of interconnected computers used by millions of people." A few months earlier, in a story about free speech online, I called the Internet "a decentralized, international web of computer networks." Another article from that same time was about a new online patent database. That one required me to define "the World Wide Web," which I dutifully described as "a graphical, easy-to-use way to look for digital information from around the globe." That was November 1995, not long after the first versions of Netscape Navigator, Internet Explorer and AOL's rudimentary browser began popularizing the Web. To protest this frustrating style edict, I sometimes seeded my stories with Yiddish words from the "sch-" pages of the dictionary. In one article, I referred to a three-dimensional computer model of rat's nose used for toxicology research as a "cyber schnoz." "You can't cut that," I told the copy editors. "It's in the dictionary." Speaking of the dictionary, I should probably remind you that newspapers were a paper-based format for distributing news and advertising to large audiences. The format was popular in 19th and 20th centuries -- before it was superseded by a decentralized, international web of computer networks called the Internet.